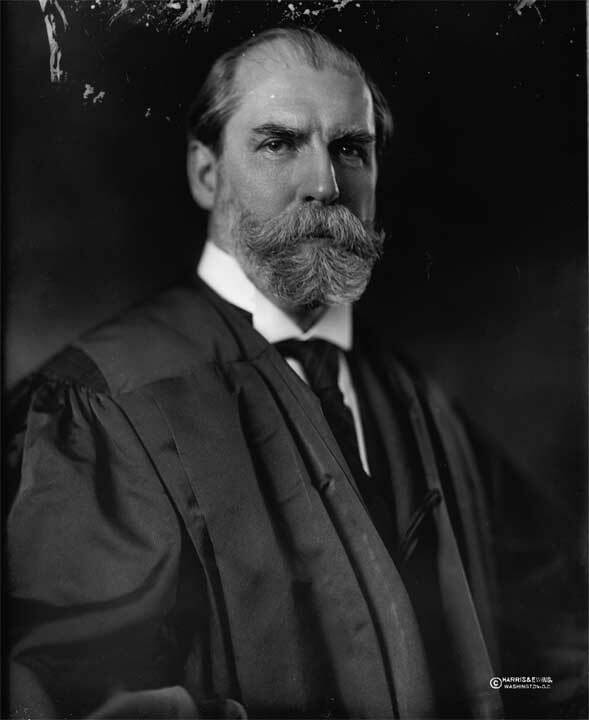 Statesman and jurist Charles Evans Hughes was born in Glen Falls, New York on April 11, 1862. He graduated from Brown University and went on to study law at Columbia University. Hughes entered private practice and became a partner in his firm within five years. His public career commences when he became counsel to the legislative committee investigating gas and electric rates. Hughes was elected governor of New York in 1905 and was appointed an Associate Justice of the Supreme Court in 1910. Hughes was nominated for the Presidency by the Republicans in 1916 and resigned his seat on the court, but was defeated by Woodrow Wilson. He then returned to private law practice until in 1921, when President Harding appointed him Secretary of State. He returned to private practice in 1925 and five years leter was appointed by President Hoover to be Chief Justice of the Supreme Court. Hughes was often the swing vote in court decisions. In the early years of the Roosevelt administration, Hughes was instrumental in striking down much of the New Deal legislation. When Roosevelt threatened to pack the Court, Hughes wisely backed down and became more accommodating to much of Roosevelt's legislative agenda. Hughes retired from the court in 1941 and the age of 79.